For one night, Lakeville’s civil war – emphasis on civil – shifted about 65 miles to the southeast down US Highway 52. When third-seeded Lakeville North and top-seeded Lakeville South squared off in the Section 1AA finals last Friday night, the Rochester Civic Center was overrun by Cougars and Panthers. It may have been a ways to travel for a game, but no one wanted to miss the party afterwards. Or the reward – a trip to the Class AA state tournament. South had to be confident after beating North twice during the regular season by a combined 9-1 score. But it was North that earned the state bid, courtesy of a surprising 5-0 victory. That excitement might have been tempered a bit the next morning, when the seeding was announced for the Class AA state tournament. North (11-15-2), the only team in the tournament field with a losing record, drew No. 1 Minnetonka in the opening round Thursday night. Schmitz was realistic about the draw, but wasn’t ready to concede without a fight. That schedule is both a blessing and a curse for the Panthers. 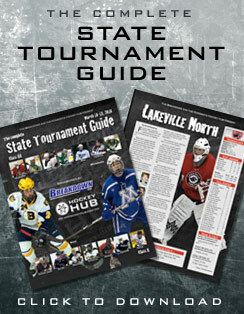 North has certainly played plenty of tough opponents, including 10 teams ranked in the Hockey Hub’s top-10 polls. That doesn’t even include two games against fellow state tournament qualifier Apple Valley. The Panthers know what a state tournament quality team looks like. Unfortunately, they’ve only gone 1-9-2 in those 11 games, which has some observers scoffing at their sub-.500 record. Sophomores have paced North’s attack for much of the season. Leading scorers Nate Arentz (20-11-31) and Brady Skjei (10-18-28) are talented players, but are very young. 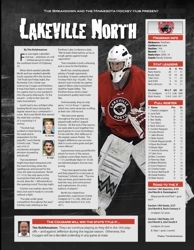 North has rotated two goaltenders, sophomore Charlie Lindgren (6-7-2, 2.86, .890) and senior Matt Arentz (5-8-0, 3.69, .871).